1. Preheat the oven to 200ºC, gas mark 6. Cook the potatoes and carrots in a large pan of boiling water for 10 minutes then add the leeks and cook for a further 2 minutes until all are tender. Drain well. 2. Meanwhile, mix together the breadcrumbs, oil and chives. 3. 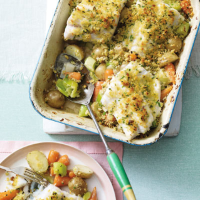 Toss the vegetables with the sauce then spoon into a large ovenproof dish. Sit the fish on top of the vegetables and sprinkle over the crumb mixture. Roast for 12–15 minutes until the fish is cooked through and the top is crunchy and golden.